We all are at different spots on our wine journey. Some have just stepped their toes in, while others have been swimming for many years, splashing about. But there is always something new that we can try or learn, which can help us to enjoy some aspect of wine more. 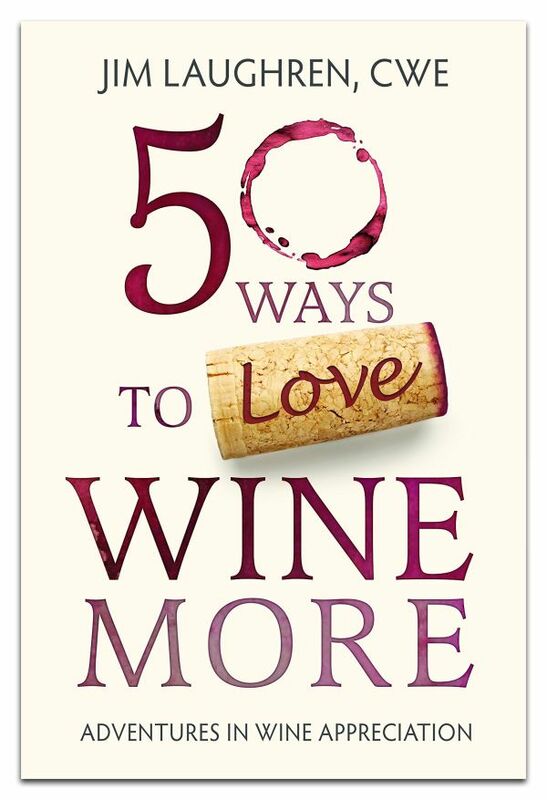 I recently received an advanced copy of Jim Laughren, CWE‘s, book titled “50 Ways to Love Wine More“. He is a certified wine educator who owned a wine distribution company in the past and is the founder of the Chicago-based consulting firm, WineHead Consulting. This is his second book, and he takes us through different ideas of how we can learn more about wine and enjoy wine more. In his 50 on the list, I think I’ve done 48, but I’ve had many years of practice. Jim has many great ideas that I think would be good for people with a little bit of wine knowledge. If you know the names of a couple of red and white grapes, and maybe a preference for a certain wine, this book would help you expand your knowledge of grapes, and regions and maybe where to go to try more wines. If you have a few years of wine drinking experience, there are still many new things for you to learn or to try. Jim mentions throughout the book many different grapes to try besides the standard Chardonnay and Cabernet Sauvignon. Have you heard of Moschofilero? All 50 chapters are generally short reads; just a few pages with enough info to get you on your way should you decide you want to do or try something. As the book can be read by anyone around the world, he cannot tell you to go to a particular store to buy a specific wine, but he does tell you a little about a grape, or the region it comes from. If you go to your local government or private liquor store, someone there should be able to help you purchase a wine from that grape. Some chapters are things that you can do locally. With global warming, the areas where grapes can be grown successfully for wine has been enlarging, and it is likely that there is a winery somewhere not too far away from you that you could visit. Yes visiting a local winery is one of the 50 things you can do. Some chapters are things that you have to drive a little further or maybe get on an aeroplane. I’ve done lots of travelling around the world, and I like to combine it with visiting a winery. Jim can tell you more in his book. The book is written in a friendly, chatty style so it should not intimidate anyone. It’s not like getting a 20-page wine list at a fancy restaurant with no explanation. Sometimes it is a little too chatty, but that is my personal preference. Drinking wine is a social activity and there are chapters about how you can enjoy wines with friends, and learn about different grapes or regions at the same time. I’ve given you many hints about some of the 50 ways to love wine more, but will stop here to let you purchase the book if you are interested to learn more and try some of Jim’s suggestions. I think it would be a good gift for people just getting into wine or with a few years of experience, with the upcoming holiday season. I see that his book is now available on Amazon.ca and Amazon.com. Enjoy.